We are a leading Manufacturer of wire rope hoist, electric overhead travelling crane and goliath / gantry crane from Chittaurgarh, India. BMT manufactures Wire Rope Hoists in SWLs ranging from 1 MT to 10 MT. 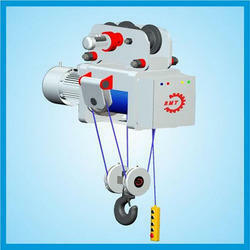 BMT Wire Rope Hoist is designed in accordance with IS:3938-1983 for medium and heavy duty operations. Hoist is directly driven through the rope drum by compact planetary gearbox with high torque rating. Siemens make sq. cage motor fitted with EMCO make “Fail to Safe” type DC Electromagnetic brake for long life, fast engagement and fast disengagement. Trolley side plates can be adjusted for different beam size by relocating the spacers. The efficiency of EOT Crane lies in the designing and compliance to the best international standards is a must. It is built in accordance to M3, M5, M7 and M8 class. The structural components of the crane are designed in accordance with IS: 800 and IS: 807. BMT manufactures Double Girder Overhead cranes in SWLs ranging from 5 MT to 100 MT. BMT can supply fully customized Double Girder Crane for different duty cycles and a diverse range of applications. Double Girder Cranes can be offered for a very large range of spans, heights of lift as well as customizable speeds depending on application. We can also provide auxiliary hoisting mechanisms on the main trolley. BMT manufactures Single Girder Overhead cranes in SWLs ranging from 1 MT to 15 MT. Typically beam or box type main girders are used depending on the span of the crane. These cranes can be offered with a range of standard electric wire rope hoists depending on the requirement. Low headroom hoists are used where vertical space is at a premium to achieve maximum lift. These EOT Cranes are known for providing cost-effective solutions due to their low dead weight. 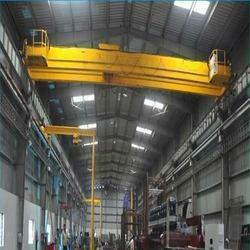 Moreover, these cranes provide greater floor coverage than any other type of Overhead Cranes. The efficiency of Goliath / Gantry Crane lies in the designing and compliance to the best international standards is a must. It is built in accordance to M3, M5, M7 and M8 class. The structural components of the crane are designed in accordance with IS: 800 and IS: 807. 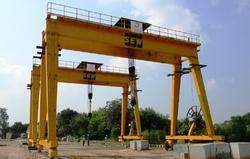 BMT manufactures Gantry Cranes in SWLs ranging from 5 MT to 100 MT. The additional leg structure makes the crane more expensive, this is offset by the considerably cheaper low level rails. That advantage increases with increased track length making them particularly suitable for large outdoor stockyards.